The Boston Globe is selling itself for parts. For three years now the hardreading staff has chronicled the $tately local broadsheet’s slapping corporate logos on a series of editorial material – from lending Capital to Suffolk University to mortgaging part of its Business section to Rockland Trust to double-dipping on the Prouty Garden dustup at Boston Children’s Hospital to ensuring that Cross Insurance could “present” part of the Globe’s Arts section. 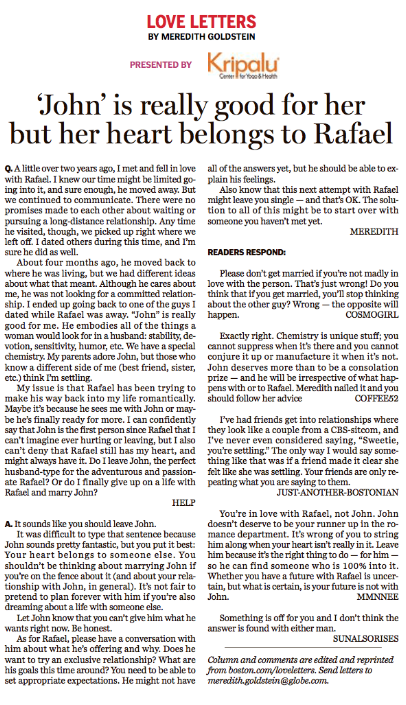 Now comes the Kripalu Center for Yoga and Health‘s mash note to Meredith Goldstein in today’s Love Letters column. 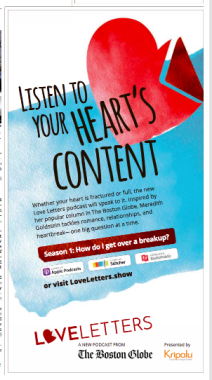 Just last week we noted how relentlessly the Globe’s print edition was flogging the Love Letters podcast in quarter-page ads that are also Kripaluscious. Stay tuned – we’re guessing the Globe next sells The Metro Minute to Swatch.